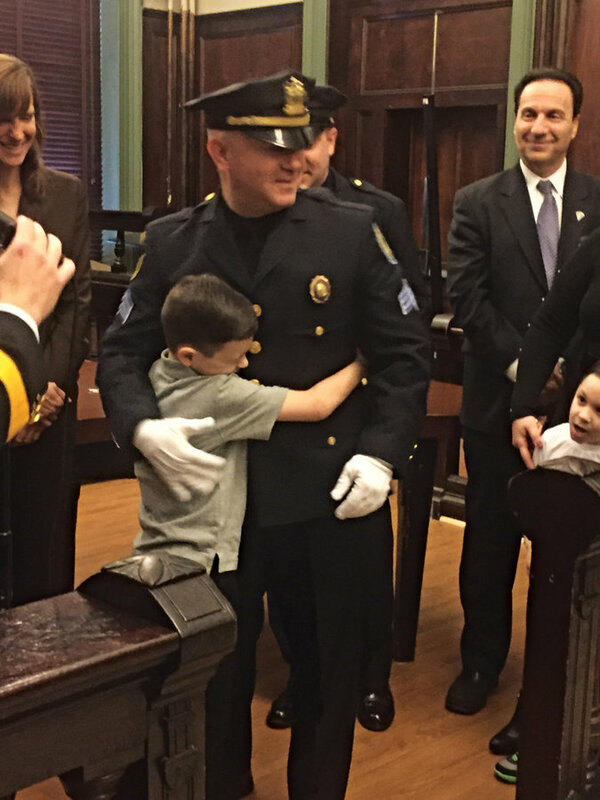 Lt. Corrado Allegretta was pinned by his eldest son Dean. Lt. Edgardo Cruz was pinned by his 17 year old son Marc. The Police Department promoted four officers in a ceremony at City Hall led by Chief of Police Ken Ferrante and Mayor Dawn Zimmer in front of a packed room of family, friends, and officials. Sergeants Edgardo Cruz and Corrado Allegretta were promoted to the rank of lieutenant. Detectives Nicholas Burke and Jill Costello were promoted to the rank of sergeant. 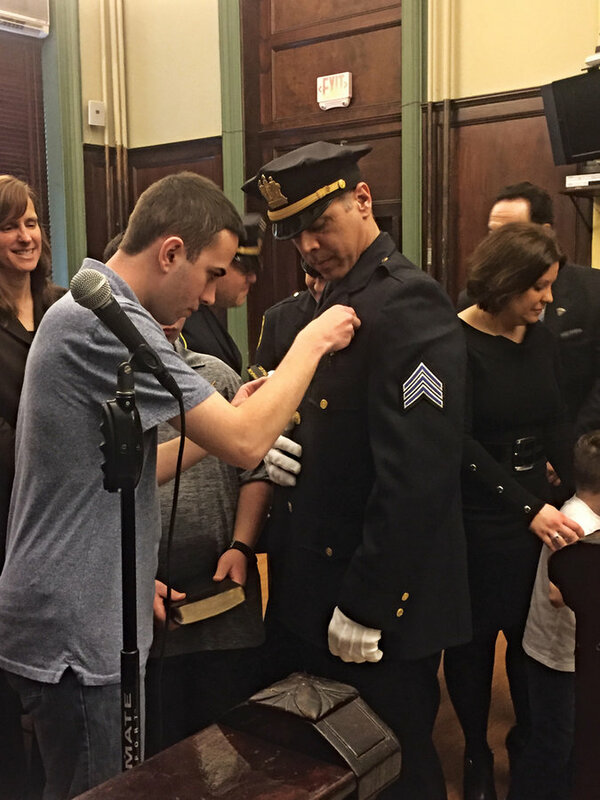 Burke said he has been with the Hoboken Police Department since 1995 and always knew he wanted to serve. Burke said that for the past few years he has been a detective with the investigative bureau working the night shift. His new role will be with the uniform patrol division, where he will supervise eight to 12 police officers. Burke said he is most interested in educating officers. The first generation police officer was sworn in surrounded by friends and family including his wife Julia and his three sons Joseph, Nicholas, and Ryan. Costello has been a part of the department for 18 years and has been working with the Bureau of Identification where she will now be a supervisor. According to Costello, this department is primarily in charge of the department’s records, including arrest reports, firearm applications, and finger prints. Of her new role, she said she is most excited about helping the department become more modern. “I’m excited about helping the bureau progress and adding positively to it by helping to bring it into the 21st Century,” said Costello. She said she has been working to help digitize all the departments’ records. Costello said she always knew she would become a police officer. 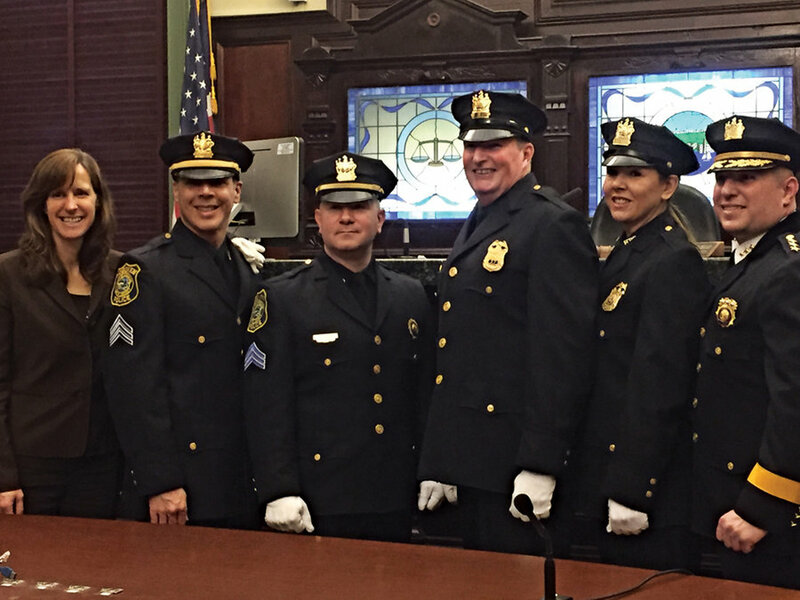 Costello is the fourth women in the history of the Hoboken Police Department to be promoted to the rank of sergeant. Costello got to share her promotion with her parents despite them being on vacation. Allegretta began his career with the Hoboken Police Department in November of 1999 and was the first in his family to become an officer. Since then others in his family have joined. According to Allegretta, he will be commander of the police department’s latest addition, the Emergency Services Unit, which is in charge of handling major incidents. Before that he worked in many other departments including the uniform patrol division, the investigative bureau, and the officer-training unit. “In the Emergency Services Unit we will be handling major incidents such as a barricaded subject and I will be the commander on scene,” said Allegretta. “Our unit is a good mix of veterans and new officers and I like to lead by example, so I will be looking forward to training along with them and instructing,” said Allegretta, who had his first day in the new role on Tuesday. Allegreta said he was proud to be pinned by his oldest son, 8-year-old Dean. Cruz has been with the department for 23 years and has been involved in several units throughout his career. Cruz will remain in the bureau of investigation and will handle OPRA requests, media releases, and manage the detectives. Cruz followed in the footsteps of his older brothers Ray and Kevin Cruz. Cruz said he had his first day of work after the promotion and had to get used to everyone calling him by his new rank. “I’ve already answered the phone a few times and said ‘Sergeant Cruz’,” he said laughing. Cruz was promoted in front of his family including his two sons Marc and Joshua and his wife Kim.